SUGARLOAF TWP. — John Augustine, president/CEO of Penn’s Northeast, believes the regional approach to economic development is working. 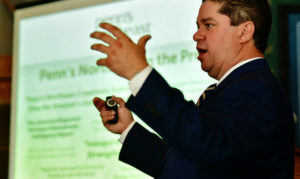 Augustine, speaking at his organization’s annual meeting at Valley Country Club in Sugarloaf Township, offered some encouraging statistics to support his claim. • More than 2,300 new jobs created in 2017-18. • The average salary for those jobs exceeds $14-$15 per hour. • There’s more than 7 million square feet of available warehouse/office space in the Penn’s Northeast six-county region — Luzerne, Lackawanna, Monroe, Wayne, Columbia and Schuylkill. Augustine said a key to improving the area’s marketability was putting together a detailed proposal for Amazon when the corporate giant was looking to locate its HQ2 headquarters. Augustine announced that Penn’s Northeast is partnering with the Times Leader Media Group on an upcoming Industrial Park Series that will cover industrial parks in Luzerne, Lackawanna, Monroe, Wayne, Schuylkill and Columbia counties. The series will feature all of the parks and show the importance of their economic impact. “We are pleased to partner with Penn’s Northeast,” Times Leader Media Group Publisher Mike Murray said. “This is an exciting time for the region and its growth and we look forward to working with the outstanding companies in the area as we put together this series highlighting the tremendous resources our industrial parks add to the northeast,” he added. Advertising Director Kerry Miscavage agreed. At the meeting, eight new board members were named to Penn’s Northeast: Doug Barbacci, Calex Logistics; Ron Beer, Geisinger; Traci Cross, Pennsylvania American Water; Ryan Decker, Highmark Blue Cross/Blue Shield; Lisa A. Hutchins, ESSA Bank & Trust; Joe Kluger, Hourigan, Kluger & Quinn; Timothy O’Shea, Sordoni Construction; Thomas Ruskey, Manpower. This website was last updated April 10, 2019.